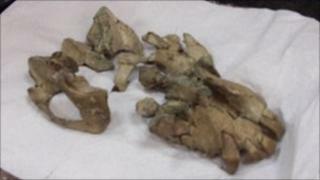 Researchers working in Uganda say they have unearthed the well-preserved fossil skull of an ancient primate. The 20 million-year-old specimen comes from the site of an extinct volcano in Uganda's north-east Karamoja region. The scientists say preliminary analysis showed the tree-climbing herbivore was roughly 10 years old when it died. The skull is about the same size as that of a chimp, but its brain was smaller. "It is a highly important fossil and it will certainly put Uganda on the map in terms of the scientific world," Martin Pickford, a palaeontologist from the College de France in Paris, told journalists in Kampala. Dr Pickford and his colleague Brigitte Senut say the fossil skull belonged to a creature they call Ugandapithecus major. Professor Senut, a professor at the French National Museum of Natural History said that the remains would be taken to Paris to be X-rayed and documented before being returned to Uganda. "It will be cleaned in France, it will be prepared in France... and then in about one year's time it will be returned to the country," she said. The remote and arid region of Karamoja is one of the least developed in Uganda.